Scientific Name(s): Cirsium discolor Muhl. ex Willd. Photographer(s) Appreciation: Thank you Robert Klips (aka Orthotrichum@Flickr) for this photo of a Cirsium discolor flower covered by soldier beetles (Cantharidae spp.) and a bumblebee (Bombus fervidus). I love this image because not only does it show how stunning the flowers of field thistle are, but also how important this species is to many insects. Thistles often get a bad rap. In some states of the USA (e.g., Arkansas and Iowa), all species of Cirsium are listed as noxious weeds, regardless of their origin (native or not). Before becoming a student, I ran a small vegetable farm in the Fraser Valley of British Columbia. There, I witnessed firsthand how just a few individual Cirsium arvense plants could soon turn into a field full of the prickly weed. Even the frequent sight of American goldfinches (Spinus tristis) flitting from one seed-filled thistle to the next was not enough to compensate for the many times that I grabbed a handful of Cirsium arvense leaves along with the carrots I was harvesting. Cirsium discolor, or field thistle, is frequently found on human-disturbed sites such as agricultural fields and roadsides. It has a pink (occasionally white) inflorescence, composed of many narrow, tube-shaped flowers billowing out from a narrow base. Most often a biennial, it grows as a basal rosette in its first year, then sends up a light green branched stem during the second year of growth. The stems have white hairs and do not have spines, while the alternate leaves are spiny, pinnately-lobed, green on the upper surface and pubescent on the lower. Field thistle closely resembles the invasive Cirsium vulgare, and the United States Department of Agriculture’s Natural Resource Conservation Service (PDF) urges us to become familiar with the different types of thistles so that we may differentiate between noxious Cirsium species and the native thistles that are important to many North American insects and other wildlife. Any easy way to distinguish Cirsium discolor from Cirsium vulgare is to look for the white, pubescent underside of field thistle’s leaves. Field thistle is native to most parts of eastern North America, and is an important food source for many wildlife species. Native bees, in particular bumblebees, are important pollinators, as are many butterflies, sphinx moths, and bee flies. Birds eat the seeds (goldfinches are particularly well-known for this) or use the fluffy white hairs on the achenes to line their nests. The soldier beetles shown in today’s photograph are likely enjoying the thistle’s abundant nectar, and it looks like the beetles on the lower right are enjoying more than just nectar. 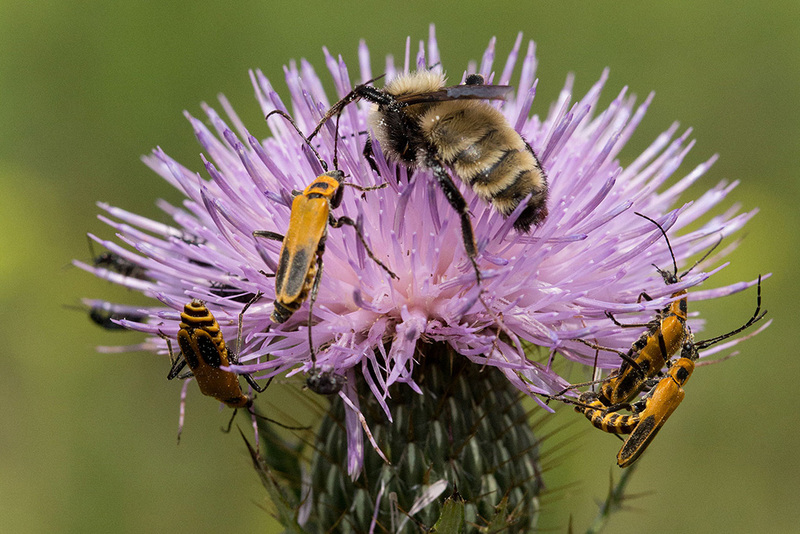 Fitz Clarke, on the Skidaway Audubon blog, recounts seeing soldier beetles fighting to mate with females on Cirsium discolor blooms, each of which had claimed her own thistle flower. I know I shouldn’t anthropomorphize insect procreation, but it does sound rather romantic! See this flower and I immediately smell the wonderful soft, spicy fragrance that some of the thistles have. Instant transport to a warm August meadow with bees droning away. Looks like Crisium flowers are popular honeymoon spots for the soldier beetles! !